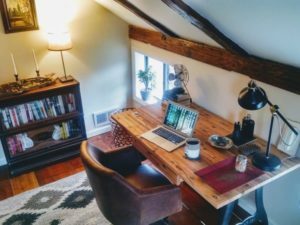 Here’s an article I penned for the Crime Files website about where I write. Note: my dog may have photo-bombed the second photo. Mr. Yates, I’m currently reading Grist Mill Road. It was a serendipitous discovery, since it’s not exactly the genre I tend to read. However, I was captivated by the mountains you refer to in the book.I live in Ohio now but am originally from northern N.J. My mother’s family lived in Pine Bush NY, not far from the NJ/NY border and we visited there a lot as kids. My great grandfather had a boarding house there where NYC residents would spend summers. We often went to, what we referred to as Sam’s Point. Later it was bought by the state and turned into Ice Caves Mountain. They put signs up, a genetic lodge at the entrance, and opened up the caves to tourists. But when we went, all you could feel was the cold blasts from the crevices to the caves; we never went in. Sam’s Point referred to a huge boulder on a flat area where supposedly a pilgrim named Sam, being pursued by Indians, jumped off into the scrub pines below and survived. The “Dinosaur Head” you referred to sounded very like that area. Did you by chance use Sam’s Point as a backdrop for your book?